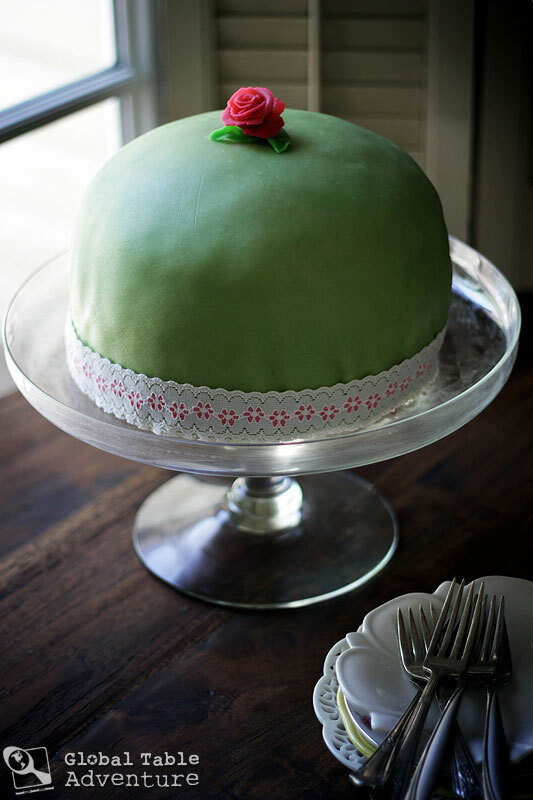 They say this spring green dome from the 1930’s made with layers of sponge cake, raspberry jam, custard, and whipped cream is DIFFICULT. Everyone says so, in fact, except for the Swedes. Curious, right? I finally figured out why: Swedish folk have great recipes and three quarters of a century’s worth of tips and tricks up their sleeves. Like, ahem, pre-rolled marzipan and boxed custard. I even saw one Swedish video which used prepacked cake, already sliced in thirds. Heat up the milk with the vanilla bean scrapings and sugar. Meanwhile, whisk together the yolks (reserve the whites for another use) and cornstarch in a medium bowl. When the milk is hot, whisk a little at a time into the yolk mixture, taking care not to curdle them. Strain the mixture back into the pot, return to the stove and cook until thickened, whisking often so that it doesn’t clump up or stick. Set aside the custard until cooled to room temperature (preferably poured onto an 8″ plate. This will make your job easier later, as it’s a bit thicker than the spreadable custard). Preheat the oven to 350F. Grease and flour an 8″ cake pan. Insert a circle of parchment paper in the bottom. Whisk together the flour and baking powder. In a standing mixer, whip the eggs with the sugar on high speed until fluffy and pale yellow. Stream in the water, then fold the flour mixture into the eggs. Pour into prepared cake pan and bake about 40-45 minutes, or until an inserted toothpick comes out clean. Let cool completely. Mix some food coloring paste into three tubes (21 ounces) of marzipan. You want to make an ounce or two of the marzipan pink, for the flower(s). Next, work on the green. The best way to do this is to mix the green into a handful of marzipan until smooth. Make it darker than you need (and save a pinch of this dark green for leaves). Then work this dark green into the remaining marzipan and work until smooth (I believe the proper technique is “break it apart, mash it, break it apart, mash it, and so on until the color is even). Once the marzipan is really warm from being worked with your hands, roll it out. Place between two sheets of parchment paper and roll out in a circle, until 2 mm thick and about 16-17″ wide (although you might want to measure your cake after you assemble it, with a tape measure, just in case you need more or less). Remove the parchment paper at the very end and roll it smooth to get rid of any lines the parchment paper may have pressed into the marzipan. Keep under tightly pressed parchment or saran until needed (so it doesn’t dry out). Cut the cake in three even pieces, as show below. Use toothpicks to guide your knife evenly (you can measure up from the bottom of the cake to help you put the toothpicks at the same height all around) TIP: I doubt you’ll have browned edges, like I did. BUT, if you do, feel free to trim off the browned edges for a more refined look. The first layer needs the raspberry jam and a scoop of whipped cream. Be sure to keep the jam away from the edge of the cake, as I have done. This will help keep it from oozing out once you press the layers together. Then add the second layer, the vanilla custard, and then a mini mountain of whipped cream. Use your spatula to smooth it into an even mound. Add the final cake layer, pressing down with your hands on the edges, to encourage it to curve. Use the last bit of whipped cream to cover the entire cake. Cover with marzipan… you might find it tricky to smooth out the marzipan. I did. So I tried again (leaving the original layer on top, so we ended up with a double coating of marzipan – yum!). You can dust your hands with powdered sugar to keep the marzipan from sticking. Decorate with green leaves and a pink flower. 1. I based my cake on a bad recipe. I didn’t realize it, but two of the recipes I originally adapted from were missing a key ingredient: water. As a result, my cake kept coming out dry and overcooked on the edges (note the bottom of this photo). 2. Food Coloring. If you really want to make your marzipan sticky, use regular food coloring. If, however, you want to keep from having a huge mess, use gel colors, such as Wilton’s (available at craft and baking supply stores). They don’t dilute the marzipan and it stays relatively mess free. Plus, you can use them for buttercream and icing. 3. I tried to roll my marzipan at room temperature. It’s much better to roll the marzipan RIGHT after you mix the color in, not later on. The heat from your hands will have made it much more pliable. You can even stand on a step stool to get some more weight behind your rolling pin. (And be sure to do it between two sheets of parchment paper, so it doesn’t stick). 4. I rolled my marzipan too thin. If rolled too thinly, the cake shows through (see below) and it encourages cracking when you try to press it onto the cake. Don’t worry, my recipe has been updated so that you use an extra tube of marzipan, so you don’t make the same mistake I did. (I later went back and doubled up over the too-thin layer, which is always an option if you make the same mistake I did). 5. I thought I could do it right on the first try. No one, not even Doctor Who, could smooth marzipan over a cake of this height without cracks or ripples… especially not on the first try… (Unless you already know how to work with fondant, in which case I’m very jealous). Somewhere I saw a blogger suggest testing out your skills on an inverted bowl. This is a great idea… because, once you get whipped cream on your marzipan, you can’t re-roll it. And marzipan is too expensive to make that mistake with. Remember, worse case scenario, you could always just drape the marzipan like a rippled curtain. 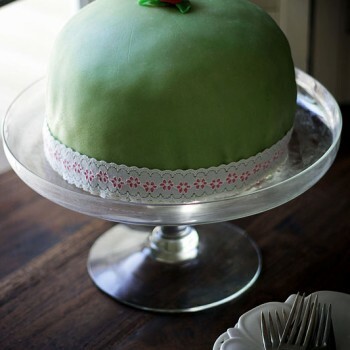 And you can hide the wrinkly seams behind ribbon (as I did) or under some extra flowers – my friend says people put flowers and leaves (and even powdered sugar) all over their cakes in Sweden to hide mistakes.